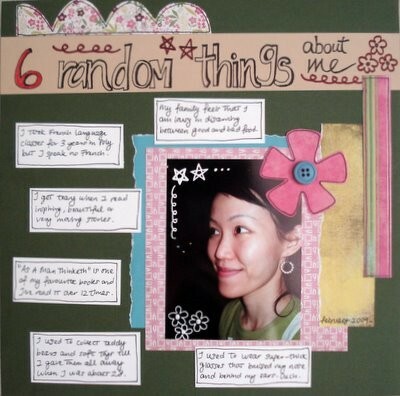 “6 Random Things About Me” is a fun scrapbooking idea! Easy and light-hearted. Simply pick 6 random things about you to share on your layout. This idea came to me as I remembered how I used to be “tagged” once or twice by other bloggers when I used to have a blog, to share random stuff about myself. So now I’m passing along the idea to you. It could be almost anything under the sun really. Six little tidbits of information about your life, about your past, about your present, or even about your future hopes. Just think of fun and interesting items to list on your page. It could just be little information about you that you don’t normally mention in the course of a conversation with someone, unless the topic pops up. If you think about it, there’s really many tiny bits of information you can gather about yourself. Spend a few minutes to create a list of them and narrow it down to six. To tie in with the theme, you can pick out a random close-up shot of yourself, which is what I did for mine. You may even want to take pictures that relate to the six items you’re mentioning about. For me, I talked about how my family feels that I can’t differentiate very well between fresh food and food that has gone a bit stale. ;-) About how I used to take French language classes years ago but speak none of it now. About how I’ll cry when I read inspiring or very touching stories. Or how I’ve read “As a Man Thinketh” for over a dozen times and it’s one of my favorite books. Now’s your turn! Go pick out some happy-looking papers, colors, embellishments and create a page about randomness, or rather 6 random bits of information about you. Have fun! Supplies used: Cardstocks – Bazzill Basics; Patterned papers – Basic Grey “Sultry” Collection; Blue paper – Grant Archival “Scrapbook Paper Pack”; Blue button – Autumn Leaves “Foof-a-la”; White pen – UniBall Signo Broad “White”; Black pen – Zig Memory System “Millennium”; Brown and red pens – Zig Memory System “Fine & Chisel”.